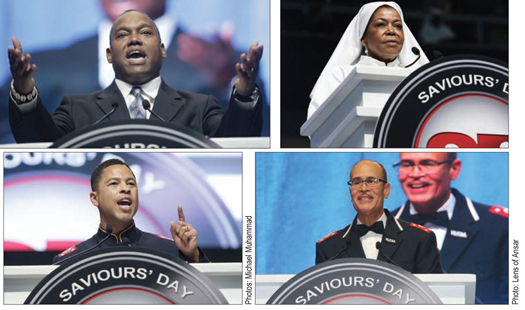 CHICAGO—Standing on the “invincible truth” he received from the Most Honorable Elijah Muhammad—the “father I never had”—the Honorable Minister Louis Farrakhan is now the “father” to millions of Black men and women who themselves never had a father, and the “Pops” to Grammy Award-winning singer and Broadway actress Stephanie Mills. 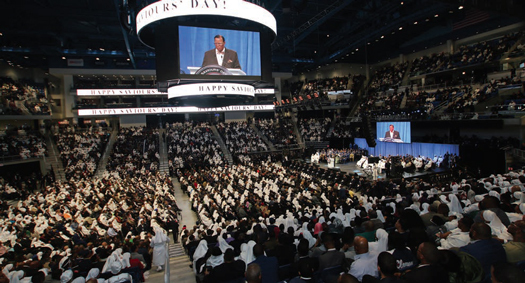 The man whose life was saved from cancer and from a death plot spawned by the enemies of Black people, boldly declared repeatedly: “Here I stand!” for the freedom of oppressed people in the United States and throughout the world in a thrilling three hour Saviours’ Day address. 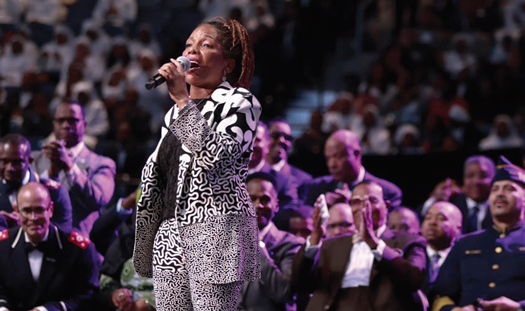 Minister Farrakhan loosed the tears of many of the thousands present when he said of the thrilling Feb. 25 performance of “To God Be The Glory,” by Ms. Mills: “I knew I would not be able to be stoic and not shed a tear. 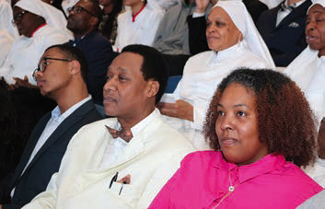 “I like my teacher looked beyond our faults and saw our needs,” Minister Farrakhan declared. “To my Christian friends, the scripture says ‘Let this mind be in you, the same that is in Christ Jesus,’ because the undeserved suffering (of Black descendants of slaves in the U.S.) has made them the heirs to the greatest gift of all, the mind of God through Jesus. “So now, I can say to the world, like Phillip, when they asked ‘When will we see the father?’ Have not I been among you this long, and you have not seen him? When you see me, you see the Father, for I am in Him and He is in me. “There is not another Black man on this earth who can speak with the power and authority, and the wisdom and the guidance of Louis Farrakhan. There is not a White man on earth, who has the strength of Louis Farrakhan. I will prove what I am saying. “If I did not love God, with all my heart and soul, my strength, I could not have withstood what you put on me. If I did not love God, and the mission of the resurrection of Black people in America and all over the world, White people would have destroyed me, a long, long, long, time ago. But here I stand! After the Muslim leader mentioned the riveting performance by Ms. Mills, he shared that she wanted to bow down at his feet to show the world her devotion to the leader who has befriended her for 46 years now, since she was just 16. Instead, she said, returning to the microphone, she expressed her passion on social media. “Fear is the worst enemy,” the Muslim leader declared, reminding his listeners that members of the Nation of Islam proceed unarmed, throughout the U.S., in some of the most dangerous places in the country. Rather than backing down, Minister Farrakhan said, he proceeded to offer a recitation of the evils committed by White people against Blacks, and before he could complete his list, the man waved his hands in the air, saying he’d heard enough. Audience listens intently to message. There is also another development which is challenging injustice among governments all around the world. “We thought the Million Man March was great, and it was. We called for a million men, and two million showed up, but when women rose up, they told every government on earth that women are not treated right,” said Min. Farrakhan. The audience filled seats in the Wintrust Arena, home court of the DePaul University basketball team, many sitting beneath the dozen or so NCAA and other conference championships. 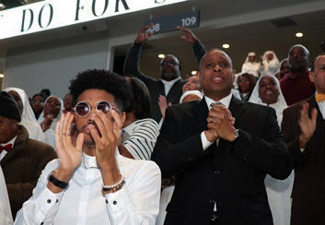 Muslim women in white garments were spread throughout the audience in every section, but most of the men—the F.O.I., the Fruit of Islam—were deployed all around and outside the arena, securing the comfort, the safety, and seating availability of all the guests. Minister Farrakhan then stood to face the greatest and most recent criticism he’s faced: that he’s an anti-Semite. Those false charges resurfaced with fury when a 12-year-old photo of Min. Farrakhan and then-Senator Barack Obama of Illinois was made public weeks ago. 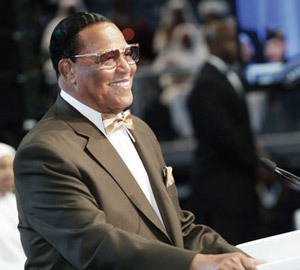 The ADL and other Jewish groups howled loudly with demands that the former president “denounce Farrakhan.” Later the same pressure was brought to members of the Congressional Black Caucus, with Jewish demands to know why the courageous leader was invited to the group’s legislative weekend, where the photo was taken. Min. 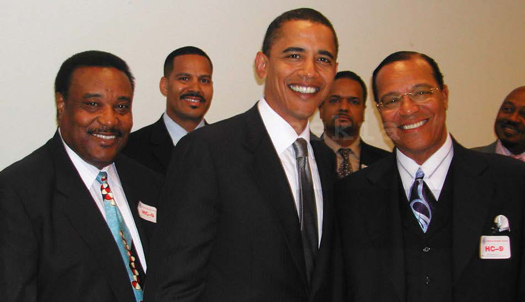 Farrakhan said he has personal photos with Mr. Obama but he would never make them public. Min. Farrakhan spoke about the 2005 photograph picturing him and then Senator Barack Obama during a Congressional Black Caucus gathering. The recent release of the 12 year old photo taken by veteran journalist Askia Muhammad, has caused controversy. Askia Muhammad, veteran journalist and Final Call senior editor, took the photo and handed copies over to a CBC staffer and a Nation of Islam official and never released the photo. 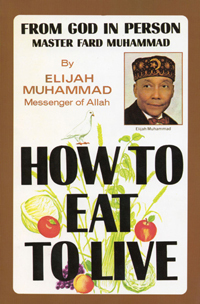 But when Askia Muhammad recently published a book, the photo was included. “When they found that picture in his book, did you know the Jews went crazy,” said Min. Farrakhan. Think, he said, what have I done that they hate me so much that they want Mr. Obama to denounce me again? “He hasn’t done it yet and I hope he doesn’t,” said the Minister. Jesus the prophet and the last prophet to the Jews was 2,000 years too soon but I’m on time, said Min. Farrakhan. These are wicked Jews, not righteous Jews that you find in revelations, that’s what the late Rev. 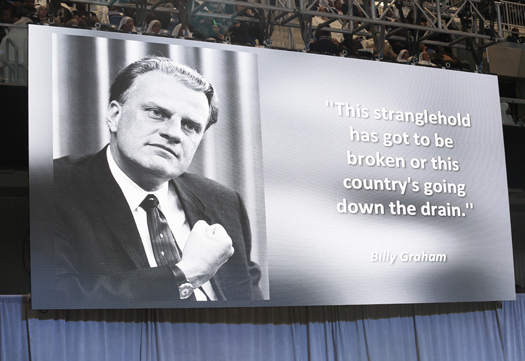 Billy Graham said to Richard Nixon, he added. Today a mighty and powerful one has chosen Blacks in America as his people, said Min. Farrakhan. Then there was a New York dinner with the president of Iran for Muslims and Muslim congressmen Keith Ellison and Andre Carson were among attendees. But, said Min. 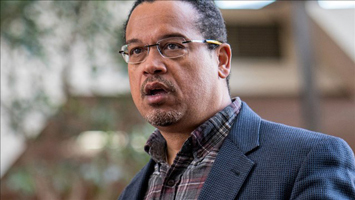 Farrakhan, reports of the congressman being in the room with me created problems and a desire to punish Mr. Ellison for being in the room with me. “The FBI has been the worst enemy of Black advancement,” he added. Jewish people have control of agencies of government and the enemy is so angry that if you like Min. Farrakhan and want something in this world, you have to denounce him or keep the relationship secret. “Jesus of 2,000 years ago never taught Black people,” said Min. Farrakhan. Though he lived for 12 years or so in Egypt, he returned to Palestine to carry out his mission. He was the last prophet sent to the Jews and to Caucasian people. Mr. Nixon and the Rev. Graham complained about the “stranglehold” which Jews in America have on areas of accomplishment in the society. But Mr. Nixon told the evangelist that he must not tell anyone his thoughts. “If the president is afraid” of Jewish power, the Minister continued, “then Negroes don’t have a chance, except through the Nation of Islam, because the Honorable Elijah Muhammad is speaking to you through me.” Even the Pope, he declared knows this truth. “I was taught by a man. He was taught by God. He (Master W. Fard Muhammad, founder of the Nation of Islam in the U.S. in 1930 in Detroit) spoke 16 languages. He wrote 10. He understood the language of the birds,” and the creatures of nature. “He mastered the language of the beings on Mars. He can recite 150,000 years of history. That’s Elijah Muhammad’s teacher,” said Min. Farrakhan. Louis Farrakhan is also unmasking the wicked rulers of the world today. “These wicked Jews—not religious Jews—are found in the Bible in the Book of John, as well as in the Book of Revelations in both the second and the third chapters. “I’m laughing at the government just thinking about harming me. So Trump, you and your boys do all you want to do to me. But with my dying breath I will be the last Black man” you destroy, warned the Minister. He talked about how the government has especially worked to destroy the Nation since the 1995 Million Man March and has sent agents into the mosques. “I can never die, because the word that I am teaching is in so many. White folks are going down, and Satan is going down, and Farrakhan, by God’s help has pulled the covers off those Satanic Jews,” Minister Farrakhan said.